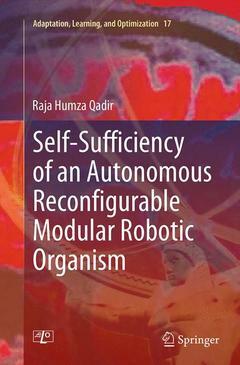 The book addresses a significant open issue in the field of autonomous reconfigurable modular robots, that is the concept of self-sufficiency, also known as energetic autonomy. First, the book introduces a behavioral modeling approach to define the self-sufficient behavior of a modular robotic organism. Second, the book addresses the challenge of dynamic power sharing in different behavioral states by proposing a software layer control system. At this point, the concept of artificial energy homeostasis is defined in the context of a modular robotic organism. Third, the book describes the development of a dynamic power management system with fault tolerant energy sharing. Forth, it introduces a low level control software for measuring both the efficiency of the developed system and its behavior in different operating conditions with real robotic modules, as well as some additional application software layer power management components. Fifth, it presents a simulation framework for simulating and exploring the effects of dynamic power sharing between multiple robotic modules in two different organism morphologies. Lastly, the book discusses different kinds of faults at an individual and a modular robotic organism level and develops a collective fault tolerant behavior at the application software layer. Importantly, this book reports on the first throughout study of energy management in self-reconfigurable modular robots. It also offers an excellent overview of the state of the art in the field. Introduction.- Background and Related Work.- Concept.- Implementation.- Experiments and Results.- Conclusion and Outlook.